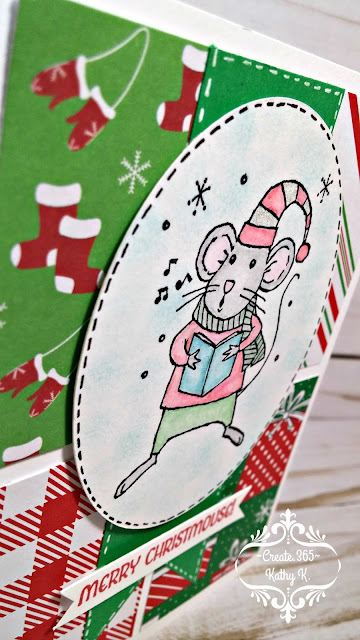 Today's card is one that the group of cardmakers from my local library will be making at our December gathering. I will be entering it @ heARTful Stamping Challenge for "Anything Goes plus a Stamp", @ Hiding in my Craftroom for "3x Designer Paper", @ 2 Crafty Critter Crazies for"Anything Goes -w/ a Critter", and @ Animal Friends Challenge for "Christmas". 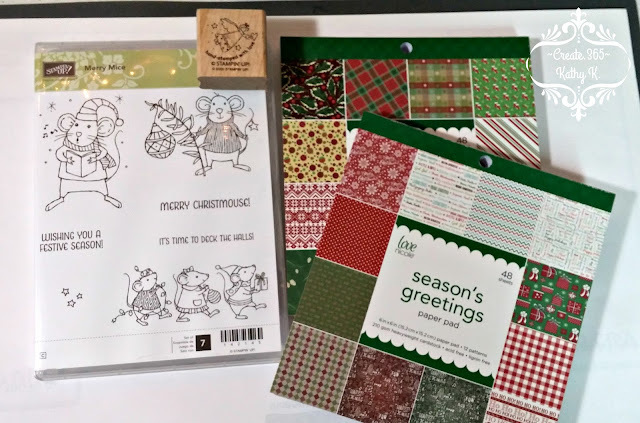 Using two new paper pads that I picked up at AC Moore a few weeks ago and a retired stamp set from the 2016 Stampin' Up! Holiday catalog, I cut the rectangles from 4 different patterns and glued them to the side folding A2 vertical card front leaving a small border of white card showing between them. 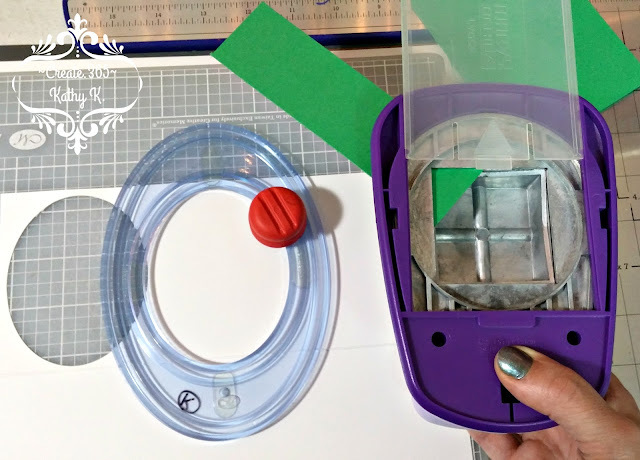 The oval came from white cardstock using my Creative Memories cutter set. The banner is a rectangle cut from green cardstock and then trimmed out using the corner of a square punch. 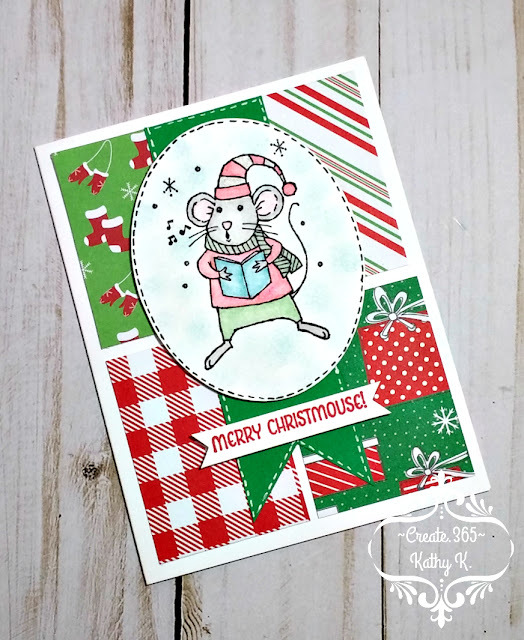 The cute mouse was stamped in black archival ink and then colored using watercolor pencils, a blender pen and accented with some clear Wink of Stella. I then tapped on some light blue ink using a sponge dauber to make the sky around the mouse. The sentiment banner was hand cut from white cardstock, stamped in red ink and mounted using mini foam dots. Using black and white gel pens, I added faux stitching along the edges of the central oval and the green banner. 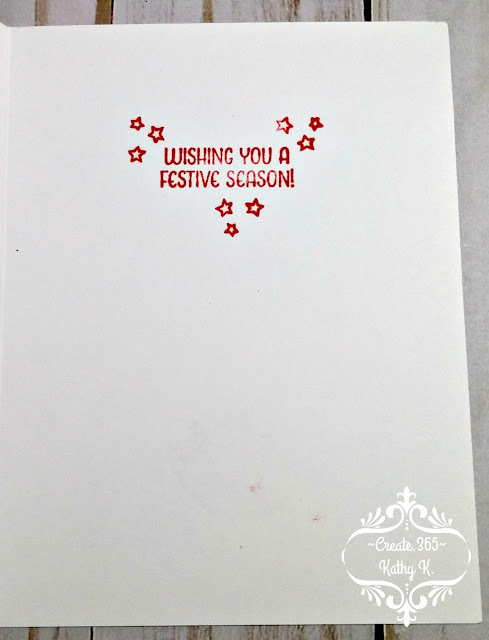 The oval is adhered using foam pop dots to lift it off the card front. Inside, the greeting and accent stars were simply stamped in Real Red ink. Really adorable. 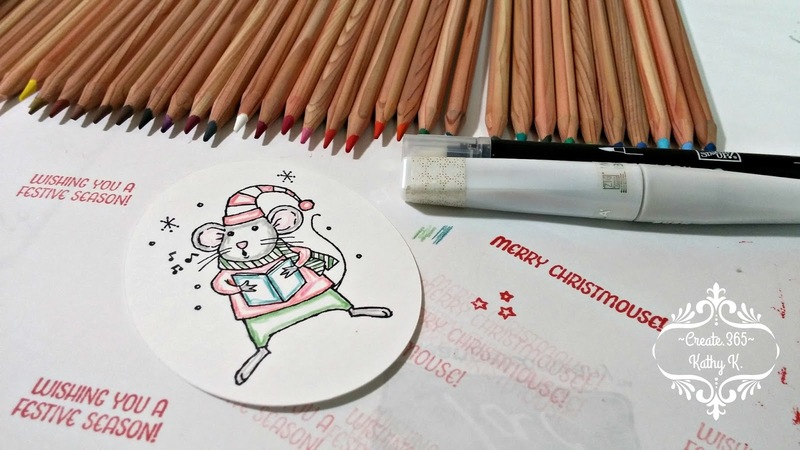 I love this mouse set :) and I'm going to CASE your background idea! Love it. awww, thank you so very much Chris! Sehr schön. Danke für deine Teilnahme bei den Animal Friends. I came across your card and hence your blog from the blog posting at Hiding in My Craft Room (which I just discovered today too). I've been spending some time today searching the internet for some crafting inspiration. The card is delightfully charming and fits all the design challenges you've used for your inspiration. Kudos! 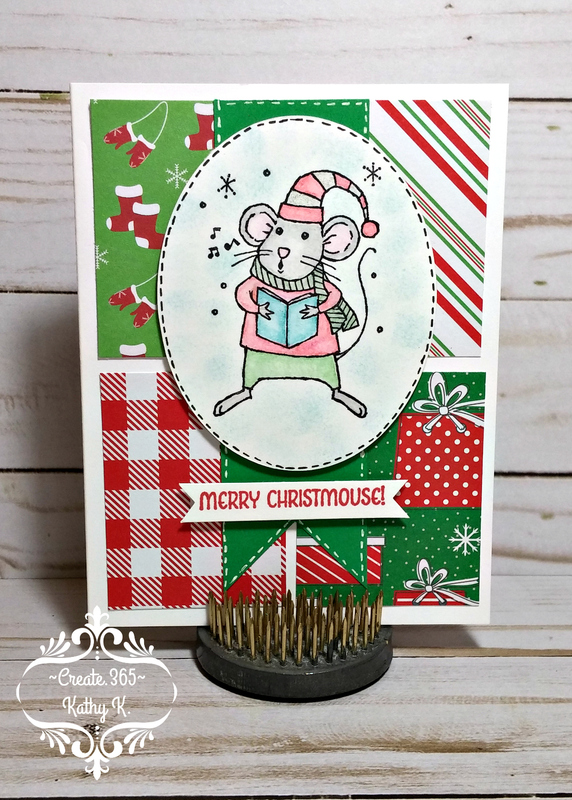 Congrats on making Top 3 over at my heARTful stamping challenge this week!